Tucked away in Midwestern obscurity, Greg Koch was a diamond in the ruff, the best kept secret in the guitar firmament. But at some point, he decided to make his move and conquer the world with his unique brand of guitarmaggedon. As he recalls of that pivotal moment, "Seven years ago my wife came home from work one day and said, 'You know what? I want to stay home with the (four) kids. You need to fire up your game.' And I said, 'Well, I'm a musician in Milwaukee, Wisconsin. Exactly what does firing the game really entail?'" .. .. Koch had already amassed a strong local following in the greater Wisconsinarea through his gigs and self-produced CDs (on his own Rhymes With Chalk label). He did the occasional recording session in Chicago and also began showcasing his jaw-dropping fretboard facility at Fender clinics a few weeks out of the year. It was at one such clinic, while demonstrating Fender's Cyber-Twin amp at the 2001 NAMM show inAnaheim, that Koch's fortunes changed. An associate of guitar hero Steve Vai caught his pyrotechnic act and within an astonishingly short amount of time, the hotshot guitarist found himself signed to Vai's Favored Nations label. The release of his 2001 Favored Nations debut, The Grip, was met with a flood of rave reviews which alternately described Koch as "a twisted guitar genius" and "fiendishly talented." And suddenly the Milwaukee guitarist was obscure no more. .. .. In his liner notes to that auspicious debut, Koch described The Grip as "Chet Hendrix meeting the Kings (BB, Albert and Freddie) at the first annual Zeppelin-Holdsworth Coffee Guzzlers Hoedown." Writer Matt Blackett later wrote in a December, 2001 feature on Koch in Guitar Player: "The licks keep coming...an impossible stream of riffs jumps off of Koch's fretboard like clowns spilling out of a VW bug -- and when you're convinced that there can be no more, out pops another one." .. .. Greg would subsequently showcase his over-the-top chops and wicked sense of humor on 2003's Radio Free Gristle and 2004's 13 x 12. He followed those primarily instrumental outings with 2005's 4 Days In the South, a song-oriented project (recorded at legendary Allman Bros.-Widespread Panic producer Johnny Sandlin's studio) that combined Koch's potent guitar playing and vocals on a set of clever, well-crafted originals like the James Gang-ish "When Were The Good Old Days?," the Zappaesque "Chicken From Hell", the nasty blues shuffle "Your Face" and the melodious "Keep On Singin'," along with a faithful rendition of Johnny Cash's "Folsom Prison Blues." As Koch explains, "The material on 4 Days in the South represents a coming to grips with my true love of vocal-oriented bluesy-tinged rock with elements of funk, country and jazz thrown in for flavor. The maniacal guitar and fiendish musical humor prevalent on Radio Free Gristle is still represented here although subdued in comparison and in the context of vocal ditties. This has always been the material I have gravitated to and certainly my period of writing instrumental guitar music happened for a reason, but it was the real deviation from the path and this is a return to it." .. .. Koch continues on that song-oriented path with Live on the Radio, which showcases his current working band, Greg Koch & Other Bad Men. With bassist Roscoe Beck (longtime sideman to guitarists Robben Ford and Eric Johnson), drummer Tom Brechtlein (a former member of Ford's Blueline band and a frequent collaborator with Chick Corea) and the charismatic Austin-based soul singer Malford Milligan (formerly the frontman for Storyville and Double Trouble), Koch again unleashes his considerable chops in the context of song forms on this vibrant live set recorded at the adventurous, alternative Milwaukee radio station WMSE located on the campus of the Milwaukee School of Engineering. "While I felt some pressure to do the pyrotechnic thing on Vai's label -- and I can't complain because it really put me on the map and gave me notoreity and that kind of stuff -- the core of what I'm really into is more of the bluesy, chicken-icking, funky, quasi-jazzy aspect of guitar playing," says Koch. "I've worked on my rhythm playing every bit as much as the lead playing, trying to have sinewy lead parts along with chunky chord parts and funky rhythm parts, and that comes across on this new recording." -- .. .. But make no mistake, there is also plenty of blistering, mind-bending fretboard feats (or in Koch-ese, "plectrum-fueled skullduggery") for six-string connoisseurs to savor on--Live on the Radio. Koch channels all the right people on this searing collection of blues, funk and R&B, including Jimi Hendrix, Albert King, Albert Collins, Jeff Beck and Roy Buchanan with touches of Stevie Ray Vaughan, Danny Gatton and Richie Blackmore thrown in for good measure. And he filters all those killer influences through his own slightly bent prism that is tinted with grunge and tinged with gristle. From faithful covers of Freddy King's "The Stumble," Jimi Hendrix's "Manic Depression" and "Spanish Castle Magic" to soulful interpretations of Sam Cooke's anthemic "A Change Is Gonna Come," T-Bone Walker's "Stormy Monday" and Delbert McClinton's "Standing On Shakey Ground." Add in some funk with the original instrumental "Mrs. Buckley--, Johnny --Guitar-- Watson--s "Don't Change Horses" and Al Green--s "Ain't No Fun For Me," and Koch's deranged guitar prowess is evident from start to finish. Some call it awesome. Koch calls it "good clean fun." .. .. The evolution of this powerhouse band began when Koch hooked up with bassist Beck (who appears on a few tracks on 4 Days In The South). As Greg recalls, "Roscoe and I met at a NAMM show about three years ago and we really hit it off right then and there, musically speaking. We had a lot in common so we thought, 'We should put a band together.'" Koch later flew Beck in to Milwaukee for a gig at Shank Hall and a couple clinics in the area along with a live appearance at radio station WMSE. "We did that WMSE appearance basically to promote the gig and they recorded it," says Koch. "And when we listened back to the stuff we said, 'This is pretty good! We could actually release this.''" .. .. They subsequently expanded on this formula to make Live on the Radio, which is the first Koch project to feature vocalist Milligan, who had been working with Beck and otherAustin luminaries in the house band for Blue Tuesday at Antone's nightclub. "With Malford handling all the vocals, I can sit back and comp and let the band percolate in a different fashion," says the guitarist-bandleader. "And I enjoy that. Plus, he's got that kind of crazy, go-for-the-jugular manic thing. He's a perfect foil for my psychosis." .. .. While Milwaukee drummer John Calarco and Austin's Brannen Templeappear on a majority of Live on the Radio, Tom Brechtlein was brought in for a track and continues to hold down the drum chair with Koch's group. The band debuted at Festa Italiana inMilwaukee in the summer of 2006 and subsequently went into the radio station to record Live on the Radio. "I think for being completely off the cuff, it's really good," says Koch of this debut outing with His Other Bad Men. "And the fidelity of the record is great. That live in the studio sound where everything is bleeding into everything else is fantastic. We're not messing with anything on this recording. We couldn't really fix anything even if we wanted to. It is what it is. You just gotta crank it up and whatever happens happens." .. .. Opening on a powerhouse note with a letter-perfect reading of Hendrix's "Manic Depression," played with a heavy duty tone that delivers a direct hit to the solar plexus, Koch & His Other Bad Men move into a searing rendition of the Freddy King vehicle, "Goin' Down," which features the guitarist skronking on a Fuzzbender pedal while dropping in references to Jeff Beck along the way. "I couldn't help but live out my '60s fantasies with that particular pedal," says Greg of his fuzzfest on that tune. The funky, Meters-inspired instrumental "Mrs. Buckley" (an inside reference to a line Orson Welles uttered in a tv commercial from an infamous blooper reel) features some slick Univibe-imbued guitar licks from Koch. Then on a show-stopping rendition of the classic slow blues, "Stormy Monday," he tips his hat to Albert King with some vicious string-bending and also salutes Roy Buchanan with some virtuosic volume swells and a solo of tortured, cathartic intensity.-- .. .. On a ripping rendition of Freddy King's "The Stumble," Koch flaunts sustained tones, remarkable speed and masterful command of his instrument during his crackling solo. Milligan turns in some soul-stirring vocals on a faithful cover of Sam Cooke's gospel-tinged "A Change Is Gonna Come-- and also on the funky Al Green selection "Ain't No Fun For Me,-- which features some stinging Tele licks from Greg. His version of Hendrix's "Spanish Castle Magic" (a tune he previously recorded live on The Grip) cleverly morphs into the Band of Gypsys' tune "Who Knows-- and culminates in a wicked wah-wah solo. Koch unveils his substantial slide chops on a unique rendition of the Delbert McClinton tune "Standing On Shakey Ground-- while on Roscoe Beck's uptempo, chops-busting instrumental shuffle "Cotton," he joins together with the bassist on some challenging unison lines on the head. The collection closes on a funky note with Johnny --Guitar-- Watson--s "Don't Change Horses,-- underscored by the Koch--s slinky rhythm guitar work. "I'm pretty proud of this collection of tunes," he says of Live on the Radio. "And I'm looking forward to getting out and playing them with this band." .. .. Born in Milwaukee in 1966, Koch got his earliest musical influences from his brother George, who was 14 years older. He later became infatuated with Jimi Hendrix and by age 12 began playing guitar. After studying jazz guitar for four years at the University of Wisconsin-Stevens Point, Greg's musical maturity led to national attention as a fiery instrumentalist, winning 1st Prize in the Bluesbreaker Guitar Showdown judged by legendary bluesman Buddy Guy in 1989. He started his own band, Greg Koch and the Tone Controls, and soon found himself in one of the most renowned groups of the region. The band went on to win five Wisconsin Area Music Awards for Blues Artist of the Year ('93, '95 through '98), and Greg personally took in seven as Guitarist of the Year ('92, '94 through '99). Putting out five independent releases, Greg Koch and the Tone Controls had acquired an increasingly growing base of fans who craved music 'outside of the box.' .. .. He later found himself as the premier clinician for Fender, the world's largest and most prestigious guitar and amplifier manufacturer. Bringing together world-class chops and a humorous ability to articulate sounds and techniques with a genuine devotion to all things guitar, Koch has developed an exceptionally effective clinic. 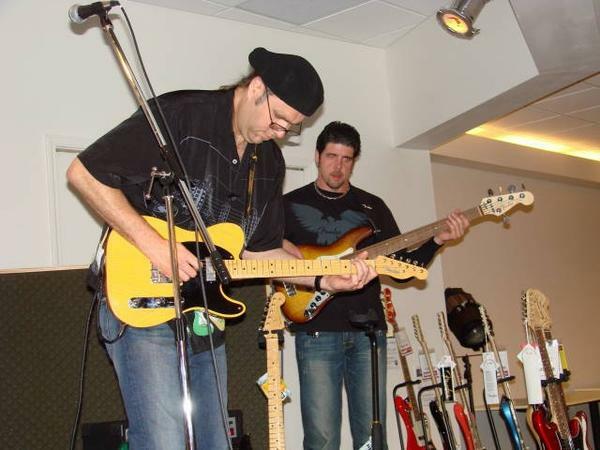 With his own tunes as a backdrop and various Fender devices as the tools, a variety of tones, tricks and anecdotes are willingly shared with those in attendance. Greg's relationship with music publishing giant, the Hal Leonard Corporation, has resulted in an extraordinarily successful catalog of guitar instructional materials including the rewrite of the Hal Leonard Guitar Method with the original author Will Schmidt, which has become the top-selling guitar method in the world. His latest Hal Leonard guitar instruction book, "Guitar Clues: Operation Pentatonic," is geared toward guitarists of all levels. "This is not a beginner's book, nor is it a grand thesis on improvisatory complexity, but folks on both ends of the spectrum can learn something from it," he writes in the introduction to the book. "I'm hoping that the 'Guitar Clues' book will be another one that will perpetuate my thousandaire status," he adds. .. .. Koch's popular Hal Leonard instructional DVDs -- two on the style of Stevie Ray Vaughan (approved by Jimmie Vaughan), one on Lynyrd Skynyrd, another celebrating revered blues stylists like Albert King, Albert Collins, Elmore James and Guitar Slim and one on his own twisted take on guitar called "Guitar Gristle" -- have revolutionized video guitar instruction with a combination of insanity, effective instruction and inspiring musical performances into a package that can only be described as "edu-tainment." -- .. .. Other books on everything from Blues and Country guitar to Lead and Rhythm playing are available by Greg and when Fender and Hal Leonard got together to put out a publication celebrating the 50th anniversary of the Fender Stratocaster by releasing a book by Tom Wheeler called "The Stratocaster Chronicles", Greg was brought in to record a program called "50 Sounds of the Stratocaster" which included him conjuring up the spirits of some of the greatest players and sounds of the Stratocaster with his trademark dialog for a CD that accompanies the book. The winning combination of Fender/Hal Leonard/Wheeler and Koch continues with the release of "The Soul of Tone" (Fall '07), a history of Fender amplification which includes a CD. of Koch's "Amps Through Time" in the spirit of the "50 Sounds of the Strat." .. .. Along with his instructional guitar books and DVDs and his own CDs as a leader, Koch also appears on synth wizard Roger Powell's 2006 recording,Fossil Poets, which features-- his earthy, toe-curling licks on top of the former Utopia keyboard player's celestial soundscapes.